The JEM-Z300FSC (CRYO ARM™ 300), equipped with a cold field emission gun, an in-column Omega energy filter, a side-entry liquid nitrogen cooling stage and an automated specimen exchange system, is a cryo-electron microscope (cryo-EM) that enables observation of bio-molecules at cryo-temperature. The automated specimen exchange system features the storing of up to 12 samples. In addition, the system allows for the exchange of an arbitrary one or more samples, thus enabling flexible scheduling. Furthermore, the combined use of a newly-designed in-column Omega energy filter and a Hole-free phase plate dramatically enhances the contrast of TEM images of biological specimens. The system is composed of a specimen stage to cool samples to liquid nitrogen temperature and a cryo-transfer system to automatically transfer the cooled samples to the cryo-stage. Liquid nitrogen is automatically supplied to the liquid nitrogen tank as required. This automated system features the storing of up to 12 samples and the exchange of an arbitrary one or more samples while the rest of the samples are kept cooled between the specimen stage and specimen exchange system. A Cold FEG produces a high-brightness electron beam with very small energy spread, offering high coherency. Thus, the CRYO ARM™ 300 achieves high resolution, high contrast imaging. 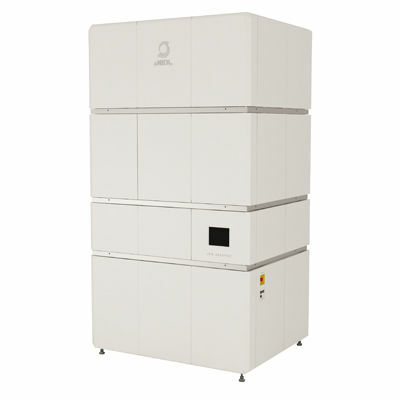 Equipped with an in-column Omega energy filter, the CRYO ARM™ 300 acquires energy filtered images and energy loss spectra. Zero-loss images acquired with the microscope provide high contrast with reduced chromatic aberration.